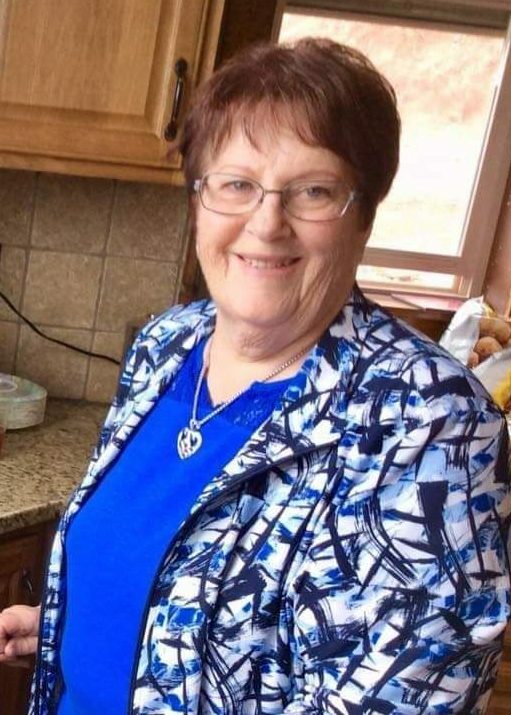 Phyllis Joann Dowse died peacefully at home on February 6, 2019. Phyllis was born on June 14, 1947 to Neil and Verine (Long) Hansen in Wolf Point. Phyllis met her soul mate Stanley Dowse at the Pleasant Valley School Dance. She started her life with Stan when he called her to go to the Wild Horse Stampede in 1964. They married on June 20, 1965. They lived in Wolf Point at the B&F Motel for 2 years before relocating to the original Dowse homestead South of Wolf Point where they raised their 3 boys, Dean, Dennis, and Darren. Phyllis was a clerk and drove the school bus for the Southview School for many years. She then worked as a ward clerk at NEMHS for the last 20 years. Phyllis loved camping, sewing, gardening, and spending time with all her grandkids. Phyllis is survived by her loving husband, Stan; 3 sons, Dean (Shannon) Dowse of Miles City, Dennis Dowse of Vida, and Darren (Carie Jo) Dowse of Vida; 7 grandchildren, Maki (Brian) Chapel, Jesse, Harley, Patrick, Spencer, Abby and Aiden; brothers, Lyle, Russ (Linda) and Marvin (Bobbi) Hansen; sisters-in-law, Mary Ann (Don) Kinnison, Loretta Dowse, and Debi Jensen; brother-in-law, Jim Lien; and numerous nieces and nephews. She is preceded in death by her parents, Neil and Verine Hansen; her brother, Raymond; her sister, Terry Lien; brother-in-law, Chuck Dowse; and father and mother-in-law, Ed and Ruth Dowse. Family will receive friends Wednesday, February 13, 2019 from 4:00 p.m. to 6:00 p.m. at the Clayton Stevenson Memorial Chapel in Wolf Point, Montana. A funeral service will be held at 1:00 on Thursday, February 14, 2019 at the First Lutheran Church in Wolf Point, Montana. Cremation will follow the services and interment at Greenwood Cemetery in Wolf Point will follow at a later date. Phyllis was a wonderful lady. Thoughts and prayers for her family. My thoughts and prayers for Stanley and his family. So sorry for your loss. So saddened by this news. My heart goes out to Stanley and the family. So Sorry for your loss, you’re in my thoughts and prayers. We are so very saddened for the loss of your wife, mom and gramma. There are no words to say other than we are so very sorry. Our mom and your mom were such dear friends, Phyllis was one of the nicest people one would ever be blessed to know. You will all be in our thoughts and prayers. Stan and family im so sorry for your loss, we will keep you in our prayers. So very sorry to hear about your loss. Thoughts and prayers to you all! We’re so sorry to hear about your loss. Thinking of you all at this time. We are so saddened to hear of Phyllis’s passing we will miss her very much. So sorry to hear about the passing of Phyllis. She was such a wonderful person. Prayers to all of the family during this difficult time. I remember Phyllis well from many years ago in 4-H. She was a lovely person. Our condolences to the family. So sorry for your loss. She was such a nice lady & so positive all the time to talk to. Our thought & prayers go out to all the family. Mecaila truly enjoyed working with her at the hospital. Take care the Martins. I’m sorry to hear about Phyllis. Thinking of you guys and sending love. My thoughts and prayers are with all of you at this time. I am so sorry for your loss. May the Lord bring you comfort. What shocking news. Love and prayers to the entire family. She was such a precious person and obviously passed that on to all of you. Hugs! I am so sorry to hear about Phyllis, she will be dearly missed. Hugs and prayers to the family. After being included in your family many years ago, my deep appreciation to Phyllis & Stan are all brought to mind. Phyllis always made me feel at home, so much so she corrected me a time or two! Phyllis’s work here on earth is done, but family is forever and one day we will all be together. I was so saddened to hear of Phyllis passing. She was such a wonderful lady who always had a smile for everyone. My condolences to the Dowse and Hanson families. Phyllis was such a sweet lady and I enjoyed visiting her at work. I will miss her. So very sorry for your loss. Phyllis was such a nice person. She will be missed by all. Very sorry to hear about your loss. My sympathy to all the family. I am saddened to hear of Phyllis passing. She was always so kind when I would see her at the hospital. My sincere condolences to her family. Our thoughts and prayers are with you, Stan, and all your family. May God bless and keep you all. Stan, Dean, Dennis, Darren and Family. I’m So Sorry to hear about Phyllis… She will be missed by so many. She was such an Amazing Lady and gave the Best Hugs! Know that I’m thinking of all of you during this hard time and sending my prayers to all of you. Here’s Big Hugs for Each of You. Love you all so much!! Stan and boys and families. Lyle, Russ, Marv and families. We are so sorry for your loss!! Phyllis was a wonderful person who was loved by all!! We wish we could have been there with you!!!! God bless you all!! You are all in our prayers!!! We are so sorry to hear about Phyllis’s death. She was a wonderful person. We enjoyed the time with you two so much at the 50th Reunion and really treasure the pictures. We are thinking of you during this time and wish you comfort and great memories. You’re in our prayers. My condolences to the Dowse and Hanson families at the passing of Phyllis. As I was watching the 700 Club today, Pat was interviewing Pat Boone on the passing of his wife Shirley (Foley). He said something I thought was very profound, “Shirley is not dead, she very much alive, she has just changed her address!” Phyllis”s work was done so she went on ahead to get things ready for you all when God is ready to call you home! May Jesus comfort your hearts and give you peace as you go through the days ahead. Stanley, Dean, Dennis. and Darren, and your families. We are so sorry to hear of Phyllis’s passing I was shocked when I heard. You all are such great people and so was Phyllis. I enjoyed the time and company of you all when I was a youngster working on Red Water with grampa Frank and any other time we were together. God Bless you all and prayers up for the loss of such an amazing lady.